Yesterday’s ANCA Now! Symposium was a great event, the likes of which I’d love to see more of. 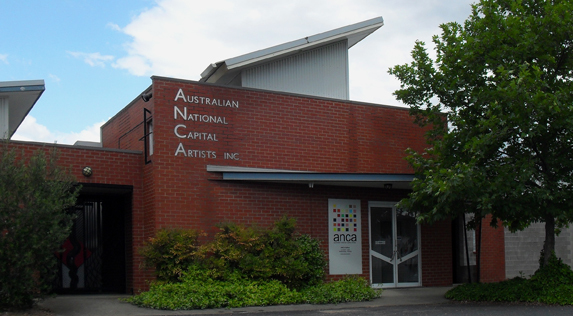 As an artistic community so accustomed to thinking about the local landscape as an overwhelming whole it was a rare and great opportunity to focus on one particular aspect – in this case of course the 21-year-old Australian National Capital Artists studios and gallery (ANCA). How excellent to be able to think clearly and talk constructively about artist run initiatives in a Canberra context, instead of having to represent the needs and wants every other arts organisation, institution and facility in town. And what a boon it was to have varying generations of artists and arts workers on hand to provide perspectives on ANCA and artist run projects in general – from members of ANCA’s founding board to future hopeful tenants. I realised how little I actually knew about ANCA – how it began, how it runs today – and was reminded how important it is for Canberra to pay heed to these kinds of success stories. Not everything here was magicked into being with the sweep of a government wand. ANCA remains an excellent facility for the production and presentation of art. For me, one of the best parts about working in this industry is visiting artists at work in their studios, and more often than not these are studios at ANCA, both Dickson and Mitchell. On these occasions I’m struck by the comfort of the studios, their conductivity to work – a perfect mix of quiet seclusion with a sense of community and shared aims. There is also an excellent mix of artists. Exhibitions at ANCA are exciting but always approachable – presenting current practice in manageable portions. They’re welcoming and engaging, not overwhelming or pretentious. All this risks making the place sound like a bit community-arts n craft-class warm and fuzzy, but to be clear the gallery at ANCA is an indispensible resource in Canberra’s visual arts landscape and has a sound mission. I have seen some astonishing, challenging, powerful works on show at ANCA, and a whole lot of similarly affecting works from ANCA tenants throughout the year. I think ANCA does what it does very well – it’s had enough time and investment (meaning, for the most part, that people have invested themselves in it) to find its place, make its mark and remain relevant and important to the function of the arts in the ACT. I think there is no question as to whether or not ANCA will continue to serve the community this way into the future, but what could help it stay one step ahead, avoid becoming stagnant and further secure its standing in the coming years? That’s something that I was asked to consider when preparing for today. It’s most probable that the future direction of ANCA will be shaped largely by the future of what an artist is. Who artists are, what the sector expects them to be. This, paired with the unique set of challenges and opportunities presented by maintaining an ACT-based practice – challenges and opportunities that are going to be with us for some time to come. There is no question that the role of the artist is largely ever-changing. Today it is unlikely that the ‘average’ artist can be found working seven studio days a week in solitude. More often than not an artist’s practice may not be the main focus of their time, but although other work, study and family commitments loom large the identity of an individual as an artist remains unchanged. ANCA does well to address this through their flexibility in the arrangement of tenancies, allowing multiple practitioners to share space and costs, reflecting the realities of modern art-making. Their current ‘Quarter for a Quarter’ scheme is an excellent example – four artists subdividing a larger studio space for short-term tenancies, maximising support for emerging practitioners and fostering sustainable approaches to setting up an arts practice. Artists are increasingly being urged to operate as small businesses, particularly when it comes to operating within funding models or seeking out and taking advantage of opportunities in the form of residencies, formal mentorships, commercial gallery representation, prizes, commissions etc. Many individuals lack the facilities and resources to act at the professional level required of them. This is not an issue faced only by ‘traditional’ artist/makers. Other freelance workers in creative fields (such as graphic designers or writers), or independent arts administrators such as curators, require workspace and access to facilities. Aside from that beautiful magical act of creating artwork the reality is that an artist may spend much of their time emailing, researching, writing applications or proposals, managing budgets and holding meetings with clients, curators, producers or collaborators. These activities themselves do not require a great deal of space, but it is different space, offering a different mindset as well as the necessary infrastructure. An ANCA of the future may be able to supply the ACT’s artists with a solution. A shared drop-in office could compliment the provision of studio space as a separate communal workspace within the studio complex – clean and sleek with bench space for laptops and access to reliable internet, printer and scanner. The same could incorporate a centrally located meeting room, for use when meeting clients, collaborators and arts workers – for times when it is inappropriate to sit perched on a step ladder among the detritus of the studio. Perhaps too this area could be equipped with projector and screen for small presentations and professional development workshops. The space would provide its users with facilities to undertake work with the level of professionalism required to develop an artistic practice into a full time career. An open-plan space, actively breaking out of the studio mentality, might encourage cross-collaboration and the sharing of skills and information between artists, building further upon the sense of community already present at ANCA. The demand for these spaces has been proven elsewhere. Co-working spaces and the practice of ‘hotdesking’ (using a desk in an established office on a casual basis) are already prevalent in larger cities, only relatively recently in Australia. Last year Canberra was introduced to this new format through The Milkbar creative studio in Kingston – an office shared by an assortment of small businesses and independent creatives. Interestingly, very similar ideas were expressed around the time of ANCAs formation. Its history suggests that the gallery was initially intended as a multi-use meeting and workshop space alongside exhibitions. Perhaps most interesting is mention of David Williams hopes, in the very early days of the organisation, that ANCA would enable artists to “highlight art as real work” making them visible and available to designers, architects etc who may new present new work opportunities for artists in the form of collaborations, commissions and consultancies. It seems it is this very same vision that could carry ANCA well into the future, responding to the changing face of artistic practice, as well as maximising what the facility has to offer its tenants, all the while increasing the level at which those tenants are able to operate in the industry. And when you put it this way, it seems that maybe ANCA has had it right all along.